Today’s guest post is by Louisiana writer Darrelyn Saloom. Read more of her posts here. 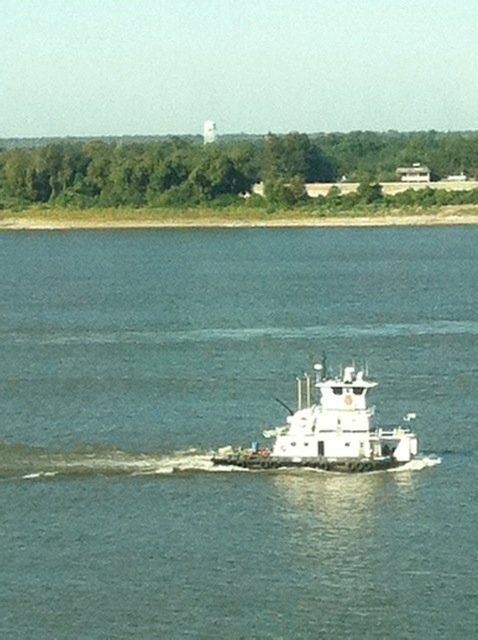 On a brisk, clear morning in Baton Rouge, I lay in a Hilton hotel bed and watched tiny tugboats push huge barges up the muddy Mississippi. Little did I know, hours later, a tugboat would arrive and tow Deirdre Gogarty and me toward publication. Across the Atchafalaya Basin, I had traveled from my home in Acadiana to attend the 2011 Louisiana Book Festival and introduce a favorite author—Sonny Brewer—who had once rescued me in Fairhope, Alabama, when I’d sprained an ankle. From my hotel bed, I had no inkling I’d later walk to the state capitol behind the man I’d come to introduce. Sure as hell didn’t know The Poet of Tolstoy Park author would pause to answer his cell phone on Fourth Street and notice me behind him. Stunned, I would manage to answer his questions about the memoir I’d spent the past five years writing with boxing champion, Deirdre Gogarty—make that four years writing and one year dogpaddling through agents’ rejections while trying not to sink. Nor had I imagined Sonny would later ask if I’d like to meet David Poindexter, the founder of MacAdam/Cage, who would arrive from San Francisco for the book event and take us to dinner. As I sipped Mint Medley tea in my hotel room that morning, none of those events entered my mind. And Deirdre and I signed a publishing contract—three days before her birthday, which marked the fifth anniversary of our collaboration. Now I’m thrilled to announce that My Call to the Ring (working title) will be published by MacAdam/Cage and in bookstores sometime in September 2012. Posted in Darrelyn Saloom, Guest Post. Ok, now I have tears in my eyes. What an incredible story. I’ll be the first to buy it off the shelf and spread the word to ALL my friends. I can’t wait to read about your journey from here on in. You made it! Thank, Jillian. It’s been great to have you on my side through this long, hard journey. Great news! 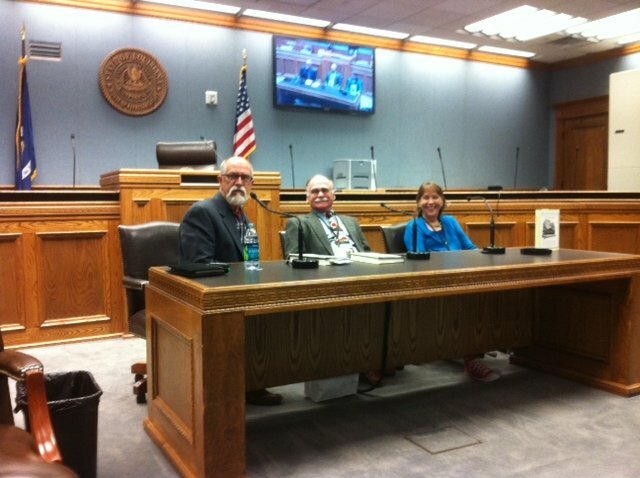 Really enjoyed the trio’s panel at the Louisiana Book Festival & seeing you and Ro. Much success! Thanks, Angie. They were so entertaining. I could have listened to that trio tell stories all day. Thanks, PJ. And I’m still off coffee. Whew! I gotta get to work! I can’t be left behind. Oh, Kat. I’m so glad your are smiling, my friend. Such good news! I love stories where virtue is rewarded and my heroines save the day.I want to read your book and help spread the word. It’s been great meeting you online, Darrelyn. Thanks for taking the first step right here on Jane’s site. Thank you, Shirley. I have enjoyed getting to know you, too. We met right here on Jane’s blog. The best place to share this announcement. There are no words for the excitement I am feeling for you & Deirdre. Okay, I’ll try…Congratulations! After reading all of your blog posts over the years, I just knew it would happen. And it unfolded like a beautiful story. You and your story are an inspiration to all of us who put the pen to paper every day. Thank you for sharing. I hope you come to Ohio on your book tour! Thanks, Jenny. It’s been quite a journey. I’d love to visit Ohio on a book tour. Even sooner perhaps when your baby is born. Wow-o-wow-o-wow, Darrelyn, congratulations! Your tugboat story tugs at my heart and I’m so happy for you! You prove that great writing coupled with persistence, networking and attention to detail ALWAYS always pays off. I’m over the moon happy for you! You’re a star * Congrats, again! And you have been a great friend through it all. Thanks, Debra. Labor to treasure, I like that. Thank you Florence. OK, I am going to say it. I TOLD YOU SO. Never an inkling of a doubt in my mind that it would happen. I am so excited for you I am about peeing my pants. Sheeesh, should I write that here? I don’t care – I am thrilled. I don’t do book reviews on my blog but in your case I will wrap it in the story of how we met and review the book, which I already know is fabulous from reading one teaser chapter. Much, much love to you and to Deirdre. Ha! Yep, you can say it here. And, yes, you did tell me so. Thanks for all your love and support. Whoop! Love the story. It demonstrates how we can learn important ‘life lessons’ through stories. Sure you can read a tip like “it’s important to network” but that may not really sink into the level you need to actually act upon it, while a real life story like this drives the point home. The lesson I gleaned from this: It’s important to show up in life so the ‘powers that be’ can play their serendipitous magic with us. Now, going to go check to see what writing conferences are in my area. Thank you, Brad. Glad you understood the message here. First you have to do the work and write a good book. Along the way, you need to show up, talk to people, support other writers, and always be kind. As I begin my day (west coast) with a story like yours, the pleasure trickles throughout the hours to come. Congratulations to you … and I dip my head with respect to destiny that found you ready! What a thrill to see the pieces and events in our lives fitting together for a great outcome. Thank you, Marion. Boy was I ready. link not working, I’ll try again. I LOVE IT when two of my favorite people end up collaborating like this – kudos to Sonny and you both!!! Be sure and send me an advance reader’s copy so I can be ready to help promote next fall. HUGS, Susan. Thanks, Susan. That is so kind of you. Will do. How could I miss with a first reader and fabulous editor like you by my side. Your suggestions are always spot on. Sometimes we can’t see the symbolism until we look back at the event. Must have been the right time and the right place, Darrelyn. I like the idea of the tugboat. Living on the west coast of Canada, we see what the tugboats do – they give a helping push or pull to get the big boats into a difficult place. Kudos to you for taking on a difficult subject. I’m sure it will be an interesting story. My interest would be in Deirdre’s struggles, so I’ll watch for book next year. Thank you, I loved watching the adorable tubboats that morning. Hope you enjoy the book when it comes out. Deirdre had plenty of struggles to keep you turning the page. Thanks, Dinty. I’ll call Deirdre right now. She’d love to hear it. Thrilled by this news!!!! Congratulations!! Congratulations to you, too, Julie. I hear your story collection “Three Squares a Day with Occasional Torture” will be published by Foxhead Books and out early 2012. Can’t wait to read! Wow, this is so inspiring. Having followed you from the beginning, it’s so exciting to hear the fight is over, and you’ve won! We’ve never met, but I’ll be proud of the book being in stores as though it was written by an old friend! That is so kind of you to say. Thank you, Jack. Thanks for all the support from everyone! It is an exciting time for us, with so much to look forward to. Thanks for all the words of encouragement. . . Thank you so much for keeping me in the loop, D! I, too, am so proud of your achievements! You are an inspiration to us all! I can’t wait to have my own signed copy!!!!!!!!! A hearty congrats to you!! Talk about synchronicity. I like the title, even if they change it to something else. Aww, thanks Dawn. Perfect timing, indeed. My apologies, Darrelyn, for the typo in your name. I didn’t even notice, Dawn. Just happy to hear from you. Oh my god D&D, congrats, am so excited for you! I’m excited, too. And ready to get to work on edits. Thanks, Greg. A movie sounds good to me. Hope to see you soon. This is so freaking EXCITING I can’t stand it! Congratulations!!! And this piece announcing your BIG NEWs is just as wonderful as the snippet of the book I’ve read. And I love MacAdam Cage. Good things are happening. Cynthia, To meet Barb Johnson right after we’d met on your blog was amazing. The entire weekend was magic. I think it had something to do with Pamela Cooper. Gal has some voodoo powers or something. Congratulations, Darrelyn! That’s a great story for a great beginning. Yay!!! About time for your much-deserved success, Darrelyn. Sounds like you put yourself in good company, too, which is all part of being a writer nowadays, in terms of real-world networking. I’ll be wishing for your continued good fortune during the upcoming edits and ultimate publication. Congratulations my friend! Words cannot express how happy I am for you. This was a great story to telling us how it all came about. It was full of excitement. I look forward to purchasing and reading your first book. Of course, I want it autographed. You deserve a knock out — only the best. Damn! Congratulations. Sorry we missed each other. It doesn’t seem enough to say, “congratulations!” I know the sacrifices you and Dierdre have made to get to this point. *big exhale* I am overwhelmingly happy for both of you. I never doubted your success in this project. I am so, so happy for both of you! I am grinning ear to ear. Tugboat? Your ship has come in! I know it is the beginning of even more success.